There are two methods for arming your system in the AWAY mode. Method one is standard and will always operate. Method two is optional and needs to be programmed by your installer. Enter your [Code] followed by the [AWAY] button. Two beeps will be heard and the AWAY indicator will illuminate. Exit time will now begin. Hold the [AWAY] button down until two beeps are heard. The AWAY indicator will illuminate and exit time will now begin. NOTE: If a zone is not sealed at the end of exit time it will be automatically isolated. It will become an active part of the system again as soon as it is sealed (i.e. If a window is opened during exit time, the window will not be an active part of the system until it is closed. Opening the window after this time will cause an alarm condition). The feature of arming the system when a zone is not sealed is known as forced arming. If this feature is not suitable, your installer can program your control panel so that it will not arm unless all zones are sealed. If the AWAY indicator does not illuminate and a long beep is heard, forced arming is not permitted. If this is the case, you must ensure that all zones are sealed or manually isolated before you will be allowed to arm the system. Enter [Code] your followed by the [AWAY] button. Two beeps will be heard and the AWAY indicator will extinguish. A flashing zone indicator represents a previous alarm on that zone. STAY mode 1 is when the system has been armed with particular zones automatically isolated. These zones must be programmed by your installer. When there is a need to arm only the perimeter of your building, this mode is extremely handy. It automatically disables the interior detection zones allowing for movement within the protected area while at the same time arming the perimeter zones. There are two methods for arming your system in STAY mode 1. Method one is standard and will always operate. Method two is optional and needs to be programmed by your installer. Enter your [Code] followed by the [STAY] button. Two beeps will be heard and the STAY indicator will illuminate. Any zones that have been programmed for STAY mode 1 will be automatically isolated and their respective indicators will begin to flash until exit time expires. At the end of exit time the zone indicators will extinguish. Hold the [STAY] button down until two beeps are heard. The STAY indicator will illuminate. Two beeps will be heard and the STAY indicator will extinguish. A flashing zone indicator represents a previous alarm on that zone. The STAY indicator will extinguish. If your system does not disarm and you see a flashing zone indicator, method one will need to be used. Method two does not operate after an alarm has occurred. STAY mode 2 is when the system has been armed with particular zones automatically isolated. Any Master Code user can program these zones before the system can be armed in STAY mode 2. When there is a need to arm the perimeter of your building, this mode is extremely handy. It automatically disables the interior detection zones allowing for movement within the protected area while at the same time arming the perimeter zones. Hold the  button down until two beeps are heard. The STAY indicator will illuminate and any zones that have been programmed for STAY mode 2 will be automatically isolated and their respective indicators will begin to flash until exit time expires. If your system does not disarm and the code pad has a flashing zone indicator, method one will need to be used. When a zone is isolated, access is allowed into that zone at all times. Isolating zones is performed by one of two methods. One way requires the use of a valid user code while the other way does not. The ability to isolate zones is governed by the priority level allocated to each user code holder. Some user code holders may not be able to isolate zones. Twenty four hour zone types and zones not used cannot be isolated. If isolation of these zones is attempted a long beep will be heard. Press the [STAY] button. Three beeps will be heard. Enter the [zone number] you require to be isolated. Press the [AWAY] button when finished. Two beeps will be heard. Isolated zone indicators will continue to flash. The system is ready to be armed. Press the [STAY] button again. Three beeps will be heard. As each zone is isolated, the corresponding zone indicator will begin to flash. If a mistake is made, re-enter the zone number that was incorrectly entered followed by the [STAY] button. This zone will no longer be isolated and the zone indicator will stop flashing. This function allows you to select which zones you want automatically isolated when the system is armed in STAY mode 2 by holding the  button down. Enter your [Master Code] followed by  and the [AWAY] button. Three beeps will be heard and the STAY indicator will begin to flash. Enter the [Zone Number] that you want isolated followed by the [STAY] button. The zone indicator will begin to flash. Enter a second or more zone numbers that you wish to isolate, remembering to press the [STAY] button after each zone selected to be isolated. Press the [AWAY] button when finished. This date and time needs to be set whenever the panel loses all power or when daylight savings is introduced. Three beeps will be heard and the STAY and AWAY indicators will begin to flash. Enter the date, month, year, hour and minute using the (DD, MM, YY, HH, MM) format. Now press the [AWAY] button. Two beeps will be heard and the STAY and AWAY indicators will extinguish. This may be useful to monitor the front door of a shop or a pool gate. Day alarm enables a combination of zones to be monitored while the system is in the disarmed state. An indication is available via any of the programmable outputs including the code pad buzzer. Only zones 1 – 8 may be used as day alarm monitored zones. If a zone has been programmed for day alarm, it can be isolated in the normal way. The isolated zone will not register as a day alarm. An output that is programmed as Day Alarm Resetting will operate when a zone selected for day alarm is triggered. The output will reset when the zone returns to normal. This can only occur if the system is disarmed. An output that is programmed as Day Alarm Latching will operate when a zone selected for day alarm is triggered. The output will reset when the button is pressed. This can only occur when the system is disarmed. Holding the  button down for two seconds will turn day alarm on or off. Hold down the  button until three beeps are heard. Day alarm is now turned on. Hold down the  button until two beeps are heard. Day alarm is now turned off. NOTE: If you have multiple zones programmed for day alarm and one of them is triggered, it is difficult to know which zone caused the day alarm. Using a latching day alarm will solve the problem. When a day alarm trigger occurs, all zone indicator’s are turned off leaving only the zone or zones that caused the day alarm illuminated. To clear the memory, press the [AWAY] button. If the zone indicator is flashing fast (On 0.25 sec/off 0.25 sec), then this indicates that one of the 16 burglary zones has gone into alarm. You should take note of this information so that it can be passed onto your installer should they require it. It is also possible to interrogate your alarm system using the “Event Memory Recall” function. This will allow you or your installer to interpret the exact sequence of events that occurred. This feature allows you to playback the last forty events that have occurred to the system. If the system has been partitioned, only 10 events will be displayed for each area. The “Event Memory Recall” mode reports all alarms and arming or disarming of the system in the STAY or AWAY modes. This function helps with trouble shooting of the system. The events are displayed via the zone indicators on your code pad. Three beeps will be heard. The events will be played back via the zone indicators on the code pad in reverse chronological order. Each event is indicated by a beep and an illuminated indicator. Resetting a 24 hour alarm in the disarmed state is indicated by one beep only. After the last event, two beeps will be heard to indicate the end of playback. The replay can be terminated at any time by pressing. the [AWAY] button. This termination will be indicated by two beeps. The zone indicators are used to show the status of the zones. The following table lists the various circumstances that the indicators will display (i.e. Zone sealed, zone unsealed). The AWAY indicator is used to inform you that the system is armed in the AWAY mode. The STAY indicator is used to indicate that the system is armed in the STAY mode. The MAINS indicator is used to indicate that the systems AC mains power is normal or has failed. The FAULT indicator is used to indicate that the system has detected a fault. There are however some modes of operation such as changing user codes where the FAULT indicator is used to represent the number ’20’. This should not be considered as a fault but interpreted as intended, according to the current mode of operation. The icon code pads provide full zone status indication at all times as well as a number of special icons which indicate such things as system armed, system disarmed, mains fail, system fault and numerous other system functions. The following table outlines all of the indicators which will be found on the code pads. A description of the various operating modes is also provided. 1 2 3 …. The ZONE indicators (1-8 on CP508L and 1-16 on CP516L) show the status of each zone. Mains Indicator The MAINS Icon indicates the status of the AC mains power supply. Armed In AWAY Mode The AWAY Icon illuminates when the system is armed in the Away mode. The [ON] indicator will also illuminate when in the Away mode. Armed In STAY Mode The STAY Icon illuminates when the system is armed in the Stay mode. The [ON] and [OFF] indicators will also illuminate when in the Stay mode. System Disarmed The Disarmed Icon illuminates when the system is fully disarmed. The [OFF] indicator will also illuminate when in the disarmed state. Zone Isolating Mode This indicator will illuminate when in Zone Isolating Mode. The person will flash once every 3 seconds. Fault Indicator The FAULT Icon will illuminate if the system has a fault condition. Steady = A fault has been acknowledged. Off = No faults have occurred. Flashing This indicator will illuminate when the system is in any programming mode. Off Indicator/ Zone Unsealed The OFF Icon will illuminate when the system is in the disarmed state and will flash when a zone becomes unsealed. It will stop flashing when all zones are sealed. On Indicator/ Zone In Alarm The ON Icon will illuminate when the system is armed in the Away mode and will flash when an alarm occurs. The indicator will reset once a valid user code is entered. A code pad duress alarm can be used as a hold up alarm. This will occur when the number  is added to the end of any valid user code that is being used to disarm the system. Adding a  to the end of a code when arming the system will not cause a duress alarm. 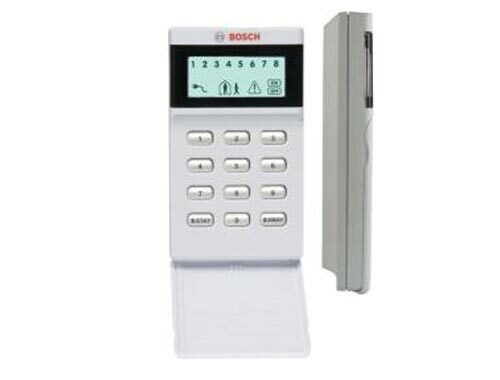 A code pad duress alarm is always silent and can only be made use of if your control panel is reporting back to a monitoring station or pocket pager. A code pad panic alarm will occur when any two outside buttons in the same horizontal row on a code pad are pressed simultaneously. This is an audible alarm. Discuss this with your installer if you require the panic alarm to be silent. A code pad panic alarm will occur when either the two outside buttons  and  or [STAY] and [AWAY] on the same horizontal row on a code pad are pressed simultaneously. This is an audible alarm. Discuss this with your installer if you require the panic alarm to be silent. A code pad fire alarm will occur when the  and  buttons on the code pad are pressed simultaneously. This is an audible alarm. Discuss this with your installer if you require the code pad fire alarm to be disabled. A distinct fire sound is emitted through the horn speaker to indicate this type of alarm condition. This fire sound is different to the burglary sound. A medical alarm will occur when the  and  buttons on the code pad are pressed simultaneously. This is an audible alarm. Discuss with your installer if you require the medical alarm to be disabled. Holding the  button down until two beeps are heard will sound the horn speaker for a two second burst. No other sounding device will sound in this mode. Holding the  button down until two beeps are heard will sound the internal sirens for a two second burst. No other sounding device will sound in this mode. If a satellite siren has been connected to the control panel, this function will also test the horn speaker for a two second burst followed by the strobe connected to the satellite siren. Holding the  button down will operate the strobe. No other device will operate in this mode. If a satellite siren has been connected to the control panel, this function will also test the strobe on the satellite siren. Hold the  button down until three beeps are heard. The strobe will begin to flash. The strobe will stop flashing. Holding the  button down until two beeps are heard will send a test report. This is used to test the dialling and reporting capabilities of you system without causing the sirens to sound. Walk Test Mode allows you to test your detection devices to ensure that they are functioning correctly. You should perform this test on a weekly basis to test the system. Before entering Walk Test Mode, isolate any zones that are not required for testing. Three beeps will be heard and the STAY and AWAY indicators will begin to flash. The code pad will beep once every second while the system is in the Walk Test Mode. Unseal and seal the zones to be tested. There are various system faults that can be detected by control panel. When any of these are present, the FAULT indicator will begin to flash and the code pad will beep once every minute. To determine the type of fault, hold the  button down until two beeps are heard. The STAY and AWAY indicators will begin to flash in unison with the FAULT indicator. One or more of the zone indicators (1-8) will also illuminate indicating the type of fault. Whenever a system fault occurs, the FAULT indicator will flash and the code pad will beep once every minute. To clear “Fault Analysis” mode, press the [AWAY] button once and two beeps will be heard. A low battery fault will register when the systems battery voltage is not capable of supplying back-up power to the system if the AC mains power fails. The battery voltage is continually being monitored. A date and time fault will register every time the system is powered up or if the system automatically resets itself due to an internal fault. Refer to setting the date and time. A sensor watch fault will register because one of the detection devices has stopped working. Hold down the  button for another two seconds to show what zone has triggered the sensor watch fault. A horn speaker fault will register if the horn speaker becomes disconnected from the main control panel. A line fault will register if the telephone line has been disconnected from the panel for more than 40 seconds. This can only occur if the line fault module has been fitted to your system. An E2 fault will register when control panel detects an internal checksum error. This fault will register when zone 16 has triggered into alarm condition if the system has been partitioned. If you are using a “Master Partitioned” code pad, the AUX indicator will be illuminated. You may need to contact your installer regarding this fault. A communications fault will register if your system was unsuccessful in calling the receiving party. The receiving party could be your monitoring station, your pager or any other telephone. This is only applicable if you have a communications dialler fitted. If the AC mains is disconnected for two minutes the MAINS indicator will flash and the code pad will beep once every minute. To stop the beeps, press the button. If the mains power returns, the indicator will stop flashing. There is no need to hold down the  button to determine this type of fault. The purpose of user codes is to arm and disarm the system as well as perform other specific functions. User codes can be any length from one to seven digits long. Each user code can have a different priority level allocated to it. This controls the behavior of the code, allowing it to arm only or to arm and disarm etc. There are seven different priority levels that can be allocated to user codes 1 – 32. Each priority level allows or restricts the functions that different user codes can perform. Note: Once user code priority levels 4, 6 and 12 have been enabled to any of the available 32 user codes, the method of “Standard Isolating” will no longer operate. Only those user codes with the priority level of 4, 6 and 12 will be able to isolate zones using the method “Code to Isolate”. NOTE: Technician is required to set the priority levels. This level allows the user code to arm and disarm the system only. This level allows the user to arm the system but not disarm it. Resetting an alarm, which has occurred during the disarmed state (i.e. A 24 hour zone) is also allowed. A Patrolman Code will allow you to issue a user code that will only disarm after an alarm has occurred. This will prevent un-authorized use of the code. A Patrolman Code can always arm the system. Isolating of zones will only be allowed by using the method “Code to Isolate” once this priority level has been set. Standard Isolating will be disabled for all user code holders. This level also allows arming and disarming of your system. This level allows a user with a Patrolman Code to disarm the system once an alarm has occurred. Isolating Zones will only be allowed by using the method “Code to Isolate” once this priority level has been set. Standard Isolating will be disabled for all user code holders. A Patrolman Code can always arm the system. Master Code functions will be accessible to any code having this priority level selected. More than one code can be allocated to this priority level. This priority level also allows arming and disarming of the system. Master Code functions will be accessible to any code having this priority level selected. More than one code can be allocated to this priority level. This priority level also allows arming and disarming of the system. Isolating zones will only be allowed by using the method “Code to Isolate” once this priority level has been set. Standard Isolating will be disabled for all user code holders. This function allows a Master Code holder to add or change a user code. Enter the [User Number] (1-32) you wish to add or change followed by the [AWAY] button. Two beeps will be heard and the corresponding zone indicator will illuminate. Enter the digits required for the [new code] followed by the [AWAY] button. If a long beep is heard then the code you are trying to create is already in the system. This function allows a Master Code holder to delete any of the system user codes. Enter the [User Number] (1-32) you wish to delete followed by the [AWAY] button. Press the [STAY] button to delete the user code. If you wish to erase any further codes, repeat this procedure as many times as required. Note: When changing or deleting user codes, the code change mode will automatically terminate if a button is not pressed within sixty seconds. Pressing the [AWAY] button will also terminate the session at any time. Press the STAY button then type in your CODE. Press the STAY button again. E.g STAY + CODE + STAY + 03 + STAY + 04 + STAY will bypass zone 3 and 4. Any additional entries will bypass other zones.